These earrings feature hand-hammered sterling silver rings that "orbit" three pieces of sea glass. Imagine sunlight shimmering on water, the sublime smoothness of sand under your feet, and the radiance of a clear, summer morning...Lisa Ronay seems to work these breezy elements into her handcrafted sea glass jewelry. 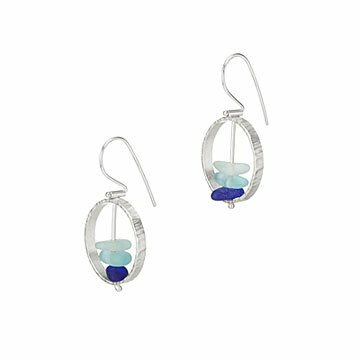 Ronay's earrings feature hand-hammered sterling silver rings that "orbit" three pieces of genuine sea glass in shades of blue or green. Sea glass starts as discarded glass that's shattered, shaped, and smoothed by the ocean before washing up on beaches. The rounded, organic shapes are a beautiful collaboration between human craftsmanship and forces of nature, so each piece features unique variations in shape, texture, and color. Handmade in Oregon. Collecting sea glass has been a passion of Lisa Ronay's for 20 years. It's a sheer joy for her to combine that with her other passion: jewelry making. Sea glass jewelry combines history, recycling, and art. The organic shapes and soft, beautiful colors inspire her to create designs with an organic shape and fun look. Lisa studied at the Revere Academy in San Francisco and the Mendocino Art Center, learning techniques that enhance her designs. She's also traveled to Italy, The Dalmatian Coast, and the Caribbean in search of sea glass. Her favorite adventure was traveling to Saint Martin to teach jewelry and collect glass..
My wife loves the beach glass jewelry. Nice quality, pretty stones. The sizes however are quite different. As with any handmade jewelry of this nature, one would expect some variation... BUT... this is quite noticeable. All the glass pieces in one earring are small while the other have large(r) pieces. The earrings are mismatched. Disappointed and hoping to exchange. Unique and well made. Worth the money. Description online and in catalog is excellent and accurate. I gave a pair to my sister, and she loves them. My husband gave me a pair, and I wear them everywhere!